A long, busy -- and entertaining -- day. 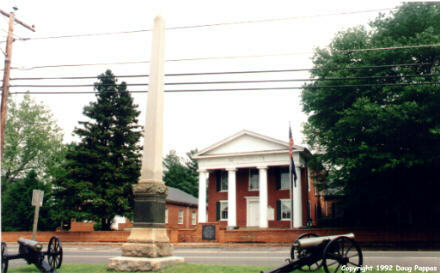 The first real stop was Appomattox Court House, site of General Lee's surrender, which effectively ended the Civil War. Not surprisingly, after the war Virginia showed little interest in preserving a site associated with the demise of the Confederacy; consequently, this tiny crossroads soon lapsed back into obscurity. Its eponymous courthouse burned down in the 1890s; the McLean House, scene of Lee's surrender, was looted and ultimately destroyed. Many decades later, the Park Service reconstructed the major buildings. Appomattox Court House is still in the middle of nowhere, not visited nearly as often as its historic importance would justify, but I enjoyed my 45-minute visit. I then spent the next seven hours crossing Virginia and catching up with more key moments in America history. In Richmond, I visited the state capitol -- designed by Thomas Jefferson, with a nice marble statue of George Washington in the rotunda and a hideous monument out front, which Dan told me was originally designed to lure his body from Mount Vernon). Further east came Jamestown, the site of the first permanent English settlement. Although only one 17th-century structure remains, the brick Old Church Tower (1639) adjacent to a 20th-century Memorial Church, the site contains many monuments, statues, and excavated foundations. Among the latter is the 1608 Glasshouse, near which costumed craftsmen demonstrate the art of glassblowing. 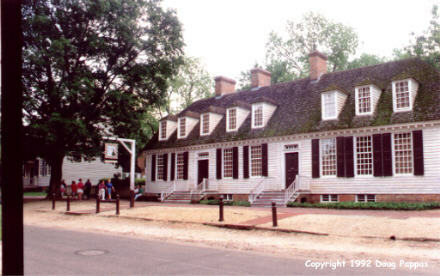 Then came Colonial Williamsburg, John D. Rockefeller Jr.'s Colonial theme park. Over a 30-year period, Rockefeller spent $90 million (more than $500 million today) rebuilding Virginia's colonial capital to larger-than-life grandeur. The houses, public buildings, gardens and streets sparkle; militiamen drill on the town square; dozens of craftsmen illustrate 18th-century trades; and the shops, taverns and inns of the historic district allow visitors to lose themselves in the Colonial era. Colonial Williamsburg contains almost 100 refurbished and 400 reconstructed buildings on 173 acres -- twice the size of Disneyland. The comparison is more apt than Williamsburg cares to admit, for whenever historical accuracy might interfere with a more pleasant visitor experience, Williamsburg opts for the visitors. No real 18th-century town looked this good or smelled this good, particularly since horses don't defecate in the streets and the costumed interpreters bathe regularly. Colonial Williamsburg's management wants patrons to park at the visitor center and buy a pass, but there's no reason for casual visitors to do so. The streets are public even if the buildings aren't. After walking through the historic district for half an hour, I continued to Yorktown, the scene of Cornwallis' surrender which effectively ended the Revolutionary War.